Hello, interwebz! Today, I have a planning post for you. There aren’t as many pictures as I normally post because I recorded a video of this and took pictures for possible thumbnails. Then, I lost of all of it. Then, I found everything. I don’t have time to edit the video, though. 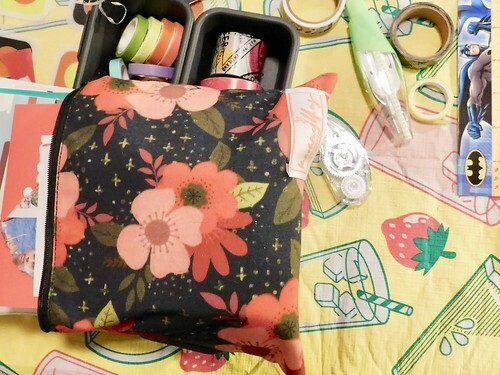 So, I’m going to try to do a June video, but I still wanted to get this one up on the blog. First up, I wanted to show you an end of the week pic of my planner. I left lots of empty space for doodling, but I ended up being so busy that I didn’t get to doodle. You can see how much I add in here other than just my planned events. I use my journal to track health info, work hours, etc. it’s a record of my life, one week at a time. For the new week, I kept things pretty simple because I was doing the video. Again, I wanted to leave room for doodling. 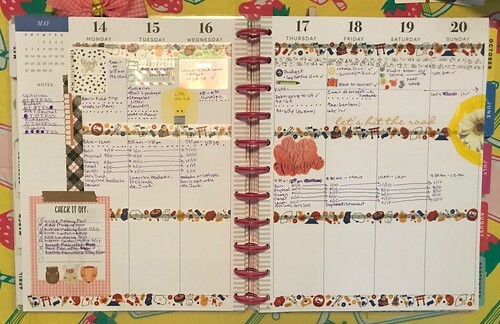 So, I brought out my washi and stickers. 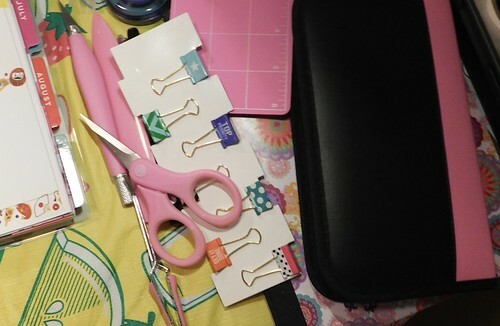 I had some new mini binder clips that I got from Tuesday Morning. These work well in my planner as a marker for the current week by helping me find the current week when I open up the journal. Lastly, there’s the end of the week pic. My week was full and I was exhausted. My in-laws were in town (an hour away on the opposite side of the metroplex), so my husband had to drive out there after work every day that they were here to show them where to eat for dinner. That meant that I didn’t get to see my husband much, but I also didn’t have to feel guilty for being exhausted and having a headache all week. I was also oncall, which makes me feel stressed and guilty. That was a hard week and I was grateful when it was over. Next time, I hope to have a planning video up with the blog post. 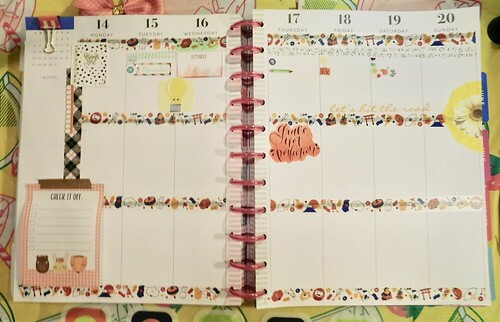 What do you think about my sparsely decorated planner? What do you do to cope with exhaustion? I’d love to hear what you think in the comments. Thanks for reading! Last week I talked about my lists, so this week I have to talk about my calendars. The lists are basically detailed versions of the calendars. 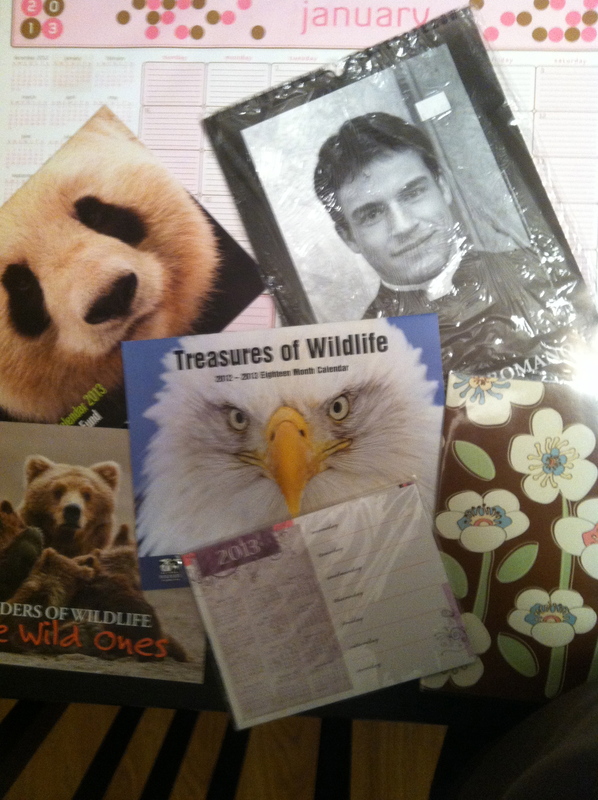 So many calendars, plus the one I forgot to include in the picture. Note the mix of cute animals and hot Italians, as mentioned in a previous post. Growing up, we only had one calendar in the house, one clock in the living room, and my dad’s alarm clock. My parents forgot events and ran late all the time. As a teenager, my room had multiple calendars and clocks. No matter where I looked, there was a calendar and clock to remind me of all of the stuff that I was not going to do. By the time my early twenties hit, I noticed that I had become a bit OCD about many things, including time. I didn’t want time to be in charge of me; I should be in charge of time. Since I wasn’t a Time Lord, I decided that I probably only needed one calendar, one clock, and maybe a watch. 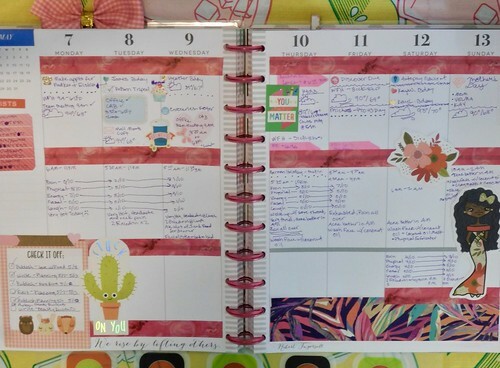 I tried to track everything in one desk calendar and one planner that I carried with me at all times. If I didn’t put the same items in both calendars, though, I would inevitably look at the wrong calendar and forget to do important tasks. This was in the days before auto-syncing with Goophones and Ipples and all that mess. You had to manually sync your calendars, planners, To Do lists, and address books. I tried to go through and do a thorough update every January, but the other 11 months of the year gave me trouble. Nowadays, I have different calendars for different themes. For example, I have a calendar with my bills’ due dates that I keep near the desktop computer because that’s where I pay my bills. (I have plenty of bills set to autopay, but too many of them charge a “convenience” fee for autopay, so I pay those as they are due. My annoyance with “convenience” fees deserves its own blog post.) For anyone concerned with my lack of tech usage, I also have plenty of calendars and reminder apps on my phone, but I still find the physical act of drawing a check mark on a calendar or crossing an item off a To Do list more gratifying than tapping a checkbox on a Goophone. When I’m motivated to keep up with the calendars, they work well. When I’m lazy or mopey, they don’t, and that’s whether I’m using a paper calendar or cellular mobile device. I’ve got my calendars for the year set up now, so here’s hoping this isn’t a lazy and mopey year. Now then, time to cross “Take a nap” off of my To Do list. Today is the last day of 2012, which means that everyone is examining the past year and planning the coming year. My friend, Cathy, did a series of blog posts in December designed to help readers figure out their goals. Her suggestions are realistic and very accessible. You even get to make lists, rate things, draw circles, etc. I’ll probably be referring to her blog when I’m setting up my various calendars for the coming year – yes, calendars, plural. Cathy and I are both organizing nerds. We get excited by hot Italians highlighters and file folders. We like to plan things out and have some sort of structure to our daily lives. Even so, Cathy’s taking a break from planning in January because she’s a bit burned out from all of the holiday planning she’s done lately. The great thing about Cathy is that she can plan and organize, but she can also roll with the punches. I admire that she can take a break from her planning when she feels like she needs it. I plan to take a break from cookies in January because I feel like I need it. As for my plural calendars, I took a break from multiple things in life over the past 2-3 years. I slowly fell out of many of the good habits that I had. Last year was especially difficult because I started the year with a new job, finishing up my bachelor’s degree (it only took me 15 years! ), and feeling hopeful about the coming year. Sometime around the summer, my summer migraines set in, my eczema flared the hell up all over my face, and my knee still wasn’t working correctly from the jogging injury a year and a half earlier. All the hope I had at the beginning of the year began sneaking out the front door. Then my mom, step-mom, dad, and best friend all had surgery within the span of a month. At that point, I just gave up. I began waking up to go to work, coming home to overeat, and then going to bed until I had to go to work again. For Thanksgiving, some friends and I visited Cathy and her sister. It was a great trip with plenty of serious discussions as well as ridiculous conversations that led to the creation of Debediah. The trip completely rejuvenated me and inspired me to finally get going on this blog and get back into the routines that keep me healthy, happy, and sane…ish. This is where the plural calendars come in – they remind me of my routines, progress, and non-routine items. I use them to remind me when to pay bills (I only autopay certain bills because convenience charges are BS), track my health, and track projects. Thanks to Cathy, I even have a calendar of hot Italians cute animals that makes me feel good every time I see it. So here’s to 2013, may it be a great year for us all!